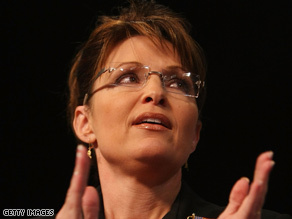 Palin: I stood up to lobbyists, oil companies, and "the good-ol' boys network"
ST. PAUL, Minnesota (CNN) -- Sarah Palin accepted the Republican Party's nomination for vice president following a lengthy standing ovation as she took the stage at the Republican National Convention Wednesday. Gov. Sarah Palin stepped into the spotlight Wednesday night at the Republican convention. In her speech, she praised John McCain as a leader who "refused to break with those troops in Iraq who now have brought victory within sight. That is exactly the kind of man I want as commander-in-chief." Palin presented herself as both a mother and as an outside-the-Beltway reformer in the McCain mold, saying she "took on the old politics as usual in Juneau" and "stood up to the special interests, the lobbyists, big oil companies, and the good-ol' boys network." She insisted that the United States seek "energy independence," including through more drilling, in the face of threats as diverse as hurricanes in the Gulf and Russian military power in the Caucasus. "Here's a little news flash for all those reporters and commentators: I'm not going to Washington to seek their good opinion -- I'm going to Washington to serve the people of this country." She assailed Democratic candidate Barack Obama as two-faced, saying "in small towns, we don't quite know what to make of a candidate who lavishes praise on working people when they are listening, and then talks about how bitterly they cling to their religion and guns when those people aren't listening," a reference to a remark Obama made in a closed-door meeting that was taped and put on the Internet. "We tend to prefer candidates who don't talk about us one way in Scranton and another way in San Francisco," she added. She took up the Republican dismissal of Obama as simply a celebrity, asking what substance lay behind his speeches. "When the cloud of rhetoric has passed, when the roar of the crowd fades away, when the stadium lights go out, and those Styrofoam Greek columns are hauled back to some studio lot -- what exactly is our opponent's plan?" she demanded. Delegates responded by chanting "Zero!" a reference to the amount of executive experience Republicans say Obama has. CNN's Dana Bash, John King and Paul Steinhauser contributed to this report.